The building’s “cladding,” part of a multi-million pound refurbishment, is thought to have caused the fire to spread. The Grenfell Tower inferno, which has left at least six residents of the Kensington apartment building dead and 74 in hospital, may have been exaserbated by material placed along the building's exterior to make it more visually appealing to nearby luxury apartment owners in north Kensington. The Independent has obtained planning documents on the Tower's "cladding," or material placed over another on a building to improve aesthetics or protect from the elements. "Experts have repeatedly warned that the addition of cladding, which is regularly used to refresh old or ugly buildings, can help spread fire," the report reads. The cladding was part of a £8.6 million refurbishment of Grenfell Tower completed in May 2016 by Rydon, a construction firm. The planning document, published in 2014, outlined the aesthetic improvements the cladding would bring to the neighbourhood. "Due to its height the tower is visible from the adjacent Avondale Conservation Area to the south and the Ladbroke Conservation Area to the east. The changes to the existing tower will improve its appearance especially when viewed from the surrounding area." It was claimed that the cladding would "improve insulation, helping keep sound and cold out from the building, and improve ventilation" for the building's residents. However, fire expert Arnold Tarling said that the kind of cladding used may have actually helped the fire spread. 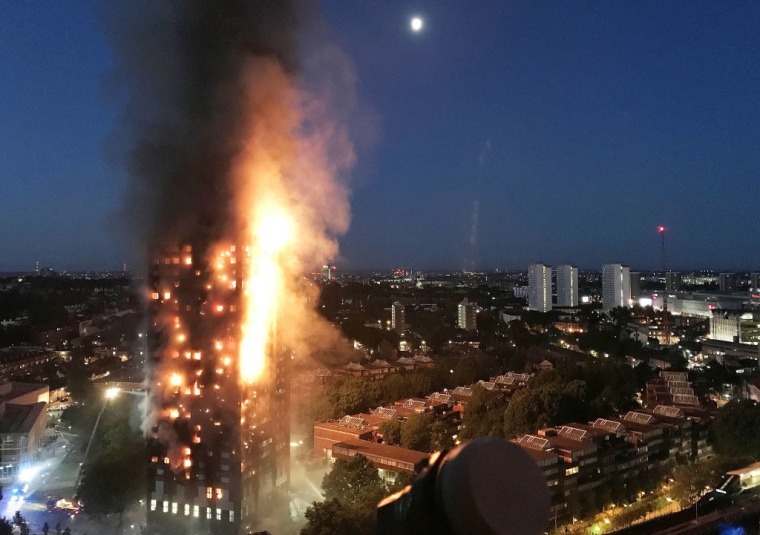 Residents of the building had been concerned about fire safety for years – on Wednesday, community activist group Grenfell Action Group shared a number of blog posts, some dating back to 2013, about an "on going culture of negligence" at the building. "ALL OUR WARNINGS FELL ON DEAF EARS," the Group wrote. The fire has brought Conservative politicians under scrutiny. Gavin Barwell, former Housing Minister and current chief of staff to Prime Minister Theresa May, is accused of suppressing a fire safety review. Labour leader Jeremy Corbyn said during a radio interview that "searching questions" need to asked to figure out why. Phillip Davis, a member of parliament, filibustered debate on a bill to make housing "fit for human habitation." Additionally, in 2013 foreign secretary Boris Johnson told an MP to "get stuffed" when he questioned cuts to fire services.